When it comes to towable RV’s, there are numerous choices available to fit nearly any budget. Because they are towed and don’t have their own engine like motorized RV’s do, the prices of some types of towable RV’s are quite reasonable. On the other hand, if you’re looking for luxury in a towable, you can find that too. The main categories of towable RV’s include: 5th wheels, travel trailers, pop-up campers (also commonly called tent campers and folding campers), truck campers, toy haulers, bike campers, and park models. Fifth wheel campers tend to be the most expensive category of towable campers. They also tend to be the heaviest so a heavy duty truck is needed to tow them. Their distinguishing feature is their gooseneck hitch that hooks up in the bed of the towing truck. They are roomy and are available with many sought after amenities such as full size kitchen areas, living rooms with flat screen TV’s and entertainments centers, and lots of storage area. Travel trailers are similar to 5th wheels in size and spaciousness although they tend to be a little smaller and lighter. The major difference is how they are towed. Travel trailers are towed using a rear hitch so it’s not always necessary to have a heavy duty truck to tow one. Some vans and SUV’s have enough towing capacity to tow some of the lighter travel trailers on the market today, especially the ultralight category of travel trailers, which are designed to be as lightweight as possible so as to negate the need for a heavy duty towing vehicle. 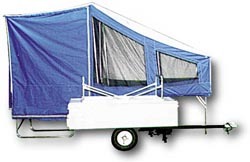 Pop-up campers are also often called folding campers and tent campers. That’s because the upper sides of the campers are typically soft-sided, made of a combination of canvas and some sort of screening and vinyl for windows; although a few manufacturers do make pop-up campers where all the surfaces are made of hard/solid materials. They are the least expensive type of towable camper which makes them the first type of camper that many people purchase. They have a low towing profile which makes towing them easy. There’s no need for special mirrors because the pop-up camper doesn’t obstruct your view while you’re driving. They are easy to store because they don’t take up much space. Truck campers, or truck camper shells, are small units that fit on to the back of a pickup truck. Although they are very compact campers, a lot of functionality is packed into their small spaces. One feature of a truck camper shell that makes it popular is that it can be removed from the truck when not in use so the truck itself can be used for day to day tasks until it’s time to go camping again. Toy Haulers are a specialized type of travel trailer that have become very popular over the last few years. The front part of the travel trailer is the living/sleeping/kitchen/bathroom area; and the back part of the travel trailer is where the grown-up toys (i.e. ATV’s, dirt bikes, snowmobiles, wave runners, etc.) are stored). Many people like to take their sport bikes, etc. with them on their camping trips. With a toy hauler a separate trailer isn’t needed to tow the bikes, etc. The enclosed area is also a secure storage facility. And, if there’s a trip where the bikes, etc. won’t be needed or where extra sleeping room is needed, many of the toy haulers have fold down beds in the back storage area, making the back area multi-functional. There are now pull along campers available for both motorcycles and bicycles. A few companies manufacturer specially designed, lightweight, compact, pop-up camping units that can be towed by motorcycles; and there are companies that design units that bicyclist can pull along too. Now when a cycling enthusiast of either kind is on a road trip, it’s no longer necessary to sleep on the hard ground in a sleeping bag at night. Although park model campers are technically towable, they are not meant to be towed with frequency. They are designed to be transported and hooked up to the utilities at the site and left there. 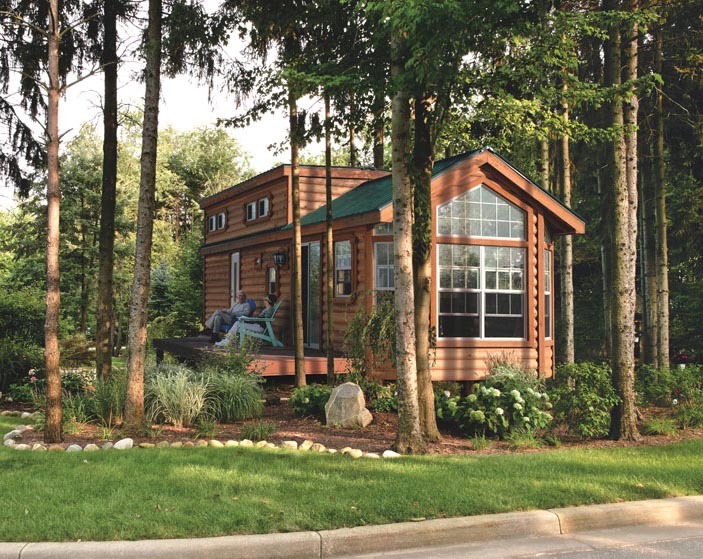 People typically place park model campers on long term campsite rental sites Park model campers can be quite large and spacious with loft areas and large vaulted living rooms that are spacious. When deciding which towable RV or camper is right for you, keep in mind how much towing capacity your current vehicle has. Unless you are going to purchase another vehicle to tow the new RV or camper you are buying, your current vehicle needs to be able to tow the RV or camper you are purchasing. This needs to be your number one consideration. You may want a 5th wheel camper, but unless you have a truck to pull one or have can invest in both the 5th wheel and a new truck, you’ll need to consider another type of towable RV. If you are new to camping and are not sure if you are going to like it, try out camping before you invest in a RV or camper. There are many dealers who rent RV’s and campers. Rent one for a week or even for a weekend to see how you like it because you invest in a camper. I think you’ll find that camping is fun and relaxing, but you want to be sure that it’s something you like to do.